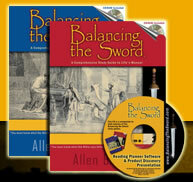 Balancing the Sword is a structured, chapter-by-chapter Bible study aid in a 3-piece format. Learn more about the two books and Bible Reading Planner software. BTS Reading Planner Software - NOW ON-LINE. No CDs Used. The BTS Reading Planner software is now on-line. Past and new owners of the BTS books or the BTS Reading Planner software may upgrade for free. Click here to learn more. 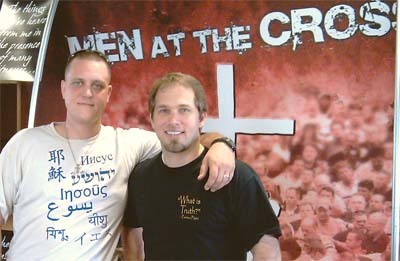 Evangelistic Tee Shirt: "Jesus" is the name which is above every name. "Go ye therefore, and teach all nations" (Mt. 28:19). Are you looking for a well-rounded study guide for the Scripture? Do you struggle to maintain a structured approach to Bible reading? Would you like to achieve a broader understanding of all the Word? Balancing the Sword was designed to give you a comprehensive working knowledge of what the Bible actually says. over 1,000 images: artistic illustrations, literal depictions, charts, and maps. Each volume covers all 66 books of the Bible. The Q&A approach of Balancing the Sword makes reading engaging. Parents and group leaders love the references because the references distill hours of research down to seconds. Images interlaced throughout will deepen your understanding and memory. Quotes by famous people will encourage you: President George Washington, Noah Webster, Charles Spurgeon, D. L. Moody, C. S. Lewis, and more than two hundred others. The software included will allow you to design a completely customized reading schedule within moments. Parents in churches all across America are losing their most precious treasure—their children. Read more. Arthelene Rippy's "Homekeepers" television program. Generations with Vision. On August 3, 2009, I was honored to be have a brief segment with Kevin Swanson on Generations Radio. The topic was the supremacy of the knowledge of God, teaching the technical knowledge of the Bible, and finding places of application. Paul said to the Ephesians, “For I have not shunned to declare unto you all the counsel of God” (Ac. 20:27). Deuteronomy 6:7 and 11:19 tell us that the teaching of Scripture to our children must be so fluid that we can teach information and application in all the organic settings of life. Success is not found in training children in the facts of the Bible alone. Information is half the formula. Finding appropriate applications makes our efforts complete. Generations Radio airs on GenerationsWithVision, OnePlace.com, SermonAudio.com, and locally in Colorado. The first half of the program is between Kevin Swanson and his co-host; the second half is between Kevin and myself. Thank you for your reply.... I have actually recommended your books/cd to several friends, and I know of at least one that has purchased it and is as happy with the software as we are.... It is a comfort for the kids and I to read daily what my husband is reading, even though he is a world away in Iraq. It helps that the kids can ask him questions about what we are reading, and he is reading the same thing on the same day, and is able to answer our questions. The printed schedule helps us both keep on track, and keeps us in the Word daily. He just arrived back in country today, so I will print one out for him and for us and send his off tomorrow. He will be happy to receive it and ask the kids questions about what they are reading as well. Thank you for your product." Praise the Lord for our godly men who faithfully serve and guide their families while also fulfilling the noble obligations of providing our national security. Would to God that we could motivate every dad who currently has discretionary time available with his family every night to lead in family-based Bible studies as Dani's husband is willing to do from the other side of the planet. I've never met this man, but my hat goes off to Dani's husband!